A 15-year-old from Currituck received the Honor Medal from the Boy Scouts of America National Court of Honor in June for his heroic efforts during a water rescue of another teen. 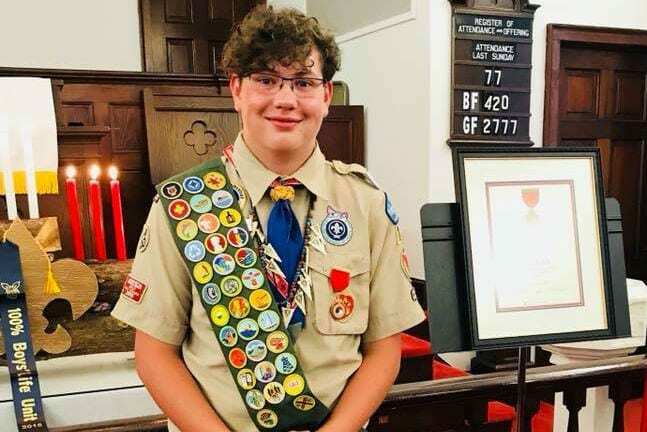 Ian Beaty, a Life Scout in Troop 182, demonstrated the skills and courage that exemplify what a Scout is, according to a news release from the Tidewater Council of the Boy Scouts. Less than 2,500 members of Scouting have been presented the Honor Medal, which recognizes those who demonstrated unusual heroism and skill or resourcefulness in saving or attempting to save life at considerable risk to self. On Sept. 15, 2017, while Beaty was taking part in a sailing program at the Northeast Academy for Aerospace and Advanced Technologies in Elizabeth City, the weather on the Pasquotank River turned poor with overcast skies and increasing wind. The conditions were becoming dangerous for the vessels that Beaty and his classmates were sailing. After he brought his boat to shore, racked it, and stowed his personal flotation device, Beaty noticed a boat had capsized with no sailor visible. The sailing instructor was on a different tack and would have taken 30 to 45 minutes to sail to the missing sailor’s aid. Without his own life jacket, Beaty immediately entered the water and swam 150 yards to the boat. He discovered Saige McDaniel, 14, on the other side of the boat in distress. McDaniel’s life jacket was improperly fastened, causing her to struggle to remain afloat. Beaty fixed McDaniel’s life jacket, which reduced her anxiety and allowed her to be more comfortable. He instructed McDaniel to float on her back while he proceeded to right the boat. He grabbed the bow line of the boat and the back strap of McDaniel’s life jacket to tow her and the boat ashore. Beaty rescued McDaniel without regard for his own safety. He could have been tangled in the lines when righting the boat, or have become too tired when swimming in the rough seas to not only swim back, but also to tow both McDaniel and the boat to safely.